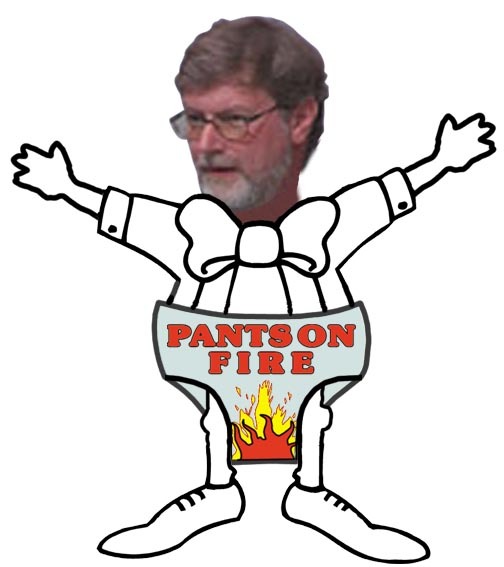 Prof T Michael Wilson, the head of Horticultural Research International has won the prestigious PANTS ON FIRE award for his remarkable track record of GM spin plus his planned closure of Stockbridge House, a highly regarded non-GM research centre that has pioneered biological pest control, hydroponics and other alternatives to GM. Wilson is certainly no friend to alternatives to biotech. Prior to HRI, Wilson was at the John Innes Centre and was then Acting Director of the Scottish Crop Research Institute, where he was followed by John Hillman who famously used the SCRI's annual report to smear organic farming. crops a beneficial technology that encouraged wildlife. However, the evidence Wilson cited turned out not to be from the source he claimed; not to be independent in the way he implied; and nor did it contain any evidence for benefits to wildlife!!! those "who raise speculative risks" and "promote public fear". Whether they had Wilson's Scotsman article or Hillman's annual report in mind, who can say. from HRI research. In other words, under Wilson, HRI threatens the death of the UK fruit industry! that public investments in science are serving to subsidise interests and outcomes that have no public mandate. It is in this context that Wilson's axing of Stockbridge House should be seen. Yorkshire, which has pioneered biological pest control, hydroponics (growing plants without soil) and other alternatives to genetic adaption of plants. HRI, which is planning to concentrate on its scientific centres at West Malling, Kent, and Wellesbourne, Warwickshire. tears at the prospect of losing tied housing on the site. Six scientists at the centre have been offered relocation to the midlands and south. former director of Stockbridge, Michael Bradley. He said yesterday: It's a viable site, it's got a good team and a good budget. There's an awful lot of horticultural science about at the moment, but much less work on the practical technology which makes that science useful to growers. Prof Wilson said that the HRI had to remain the major UK player, fighting fit, competitive and the source of the highest quality research and development". expertise in generating high energy X-ray beams to penetrate the structure of proteins, potentially invaluable in the development of medical drugs.